Good afternoon and happy Wednesday. We had a little bit of sunshine today (before the biblical rains came) so in a moment of Springlike madness I made this. One thing I didn't take on holiday recently was a bookmark - to be fair I probably didn't have room I took so many Winter woolies, so I now have a posh one! I used the wonderful chick from the Rubber Dance Textured Spring set, and the words are from Four Seasons. I'm entering this into the Simon Says Stamp Monday challenge, which is to use a trio of something. Labels: Rubber Dance Stamps, Simon Says Stamp Monday Challenge. I love your bookmark Sue with it's little spring chick images, I'm rubbish with bookmarks as i'm always forgetting to take them out of finished books. The library always gets a free one when I return my books hee hee!! 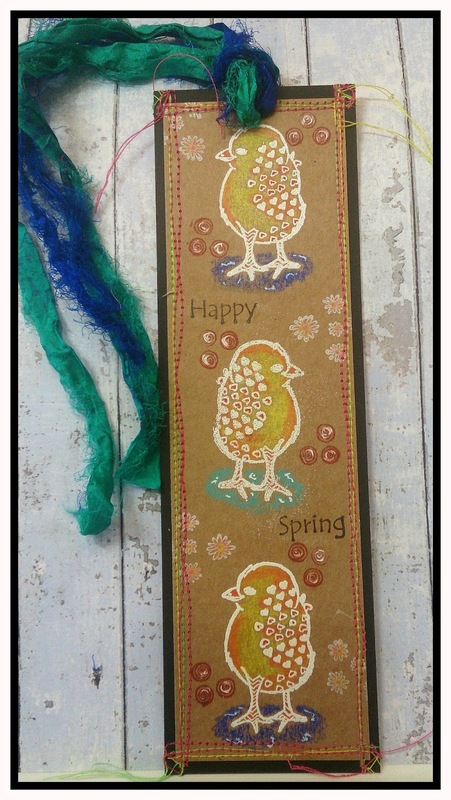 Lovely bookmark, love the soft colors on the kraft base. Thank you for joining us over Simon Says Stamp Monday Challenge.